I have been enamored of architectural lighting and neon and electric signs as an element of the built environment for quite some time. But I hadn't considered the issue as systematically as I should have, for example along the lines of the six elements identified in the Eindhoven Lighting Master Plan discussed below. F Street in Downtown Washington, DC in the 1950s. Image from Reston Paths. 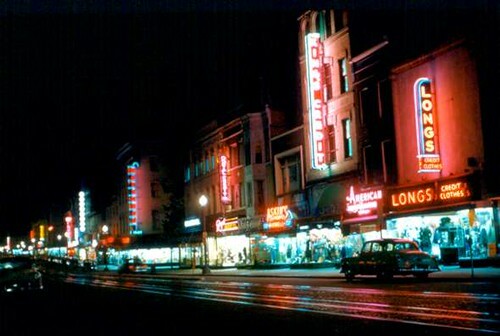 In the days of thriving center city commercial districts and neighborhood theaters, electric and neon signs were distinctive elements of the visual identity of these districts. And even when the stores were closed at night, attractive signs denoting the businesses and their wares were typically lighted. Some interesting architectural lighting programs and events I've come across over the years include the program in Cleveland to light church steeples (Steeple Lighting Program, Cleveland Restoration Society), various lumiere festivals--mostly in Europe (e.g. Lux Helsinki), and light art and temporary lighting installations. 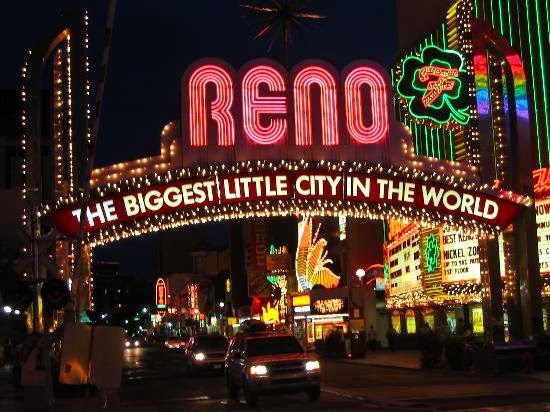 Of course, Times Square in New York City, NYC's Broadway Theatre District and the lighted marquees, "The Strip" in Las Vegas, and the entryway to Reno's casino district are prominent examples of places that continue to define themselves through "out of this world" lighted signage. Image from NYC Loves NYC blog. On Broadway, the McDonald's Restaurant has incorporated a lighted marquee into the facade as an element of its store design, to leverage and connect to the area's cultural and architectural heritage. New chandelier in Cleveland's Playhouse Square. Playhouse Square is a national best practice example of arts, in this case, theater, based revitalization. Playhouse Square had four large theaters that by the 1960s, had largely been abandoned in response to suburbanization. An architect assigned to figure out what to do realized that the theaters could be combined into an integrated operation by creating a common entry-foyer system. Since then the Playhouse Square Foundation has been organized as a community development corporation and has been spearheading the revitalization of that area (see the past blog entry, "The Howard and Lincoln Theatres: run them like the Pittsburgh Cultural Trust/Playhouse Square Cleveland model"). Image from Channel 5, Cleveland shows the various elements of the lighting project, which are not limited to the new chandelier. Image: Joshua Gunter, Cleveland Plain Dealer. 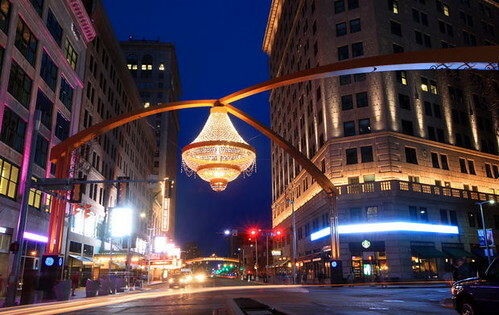 The latest element introduced to the Playhouse Square district by the Foundation is a chandelier, the world's largest outdoor chandelier, placed at "the center of Playhouse Square" at 14th Street and Euclid Avenue. It was lit in an opening ceremony on May 2nd, an event which attracted over 20,000 people, place at the intersection of , as a way to further define the visual elements of the area, by playing off how the old grand theaters typically had chandeliers as the centerpiece of their foyers. See "Playhouse Square's chandelier succeeds as an instant icon for Cleveland's theater district" from the Cleveland Plain Dealer. 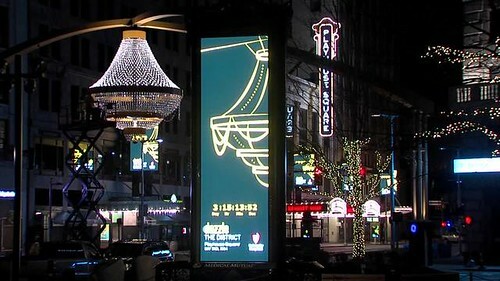 ... the 20-foot-tall outdoor chandelier – officially declared by Guinness last week as the largest in the world - is already helping to create the visible vitality that Playhouse Square has long sought and never quite achieved. Even though the theater district has attracted a million visitors a year to its revitalized 1920s movie palaces and Vaudeville houses, the liveliness has never seemed to reach out to Euclid Avenue, the city’s once and future Main Street. The chandelier is part of a broader set of streetscape improvements and identity elements, including gateway arches, kiosk signage, etc. 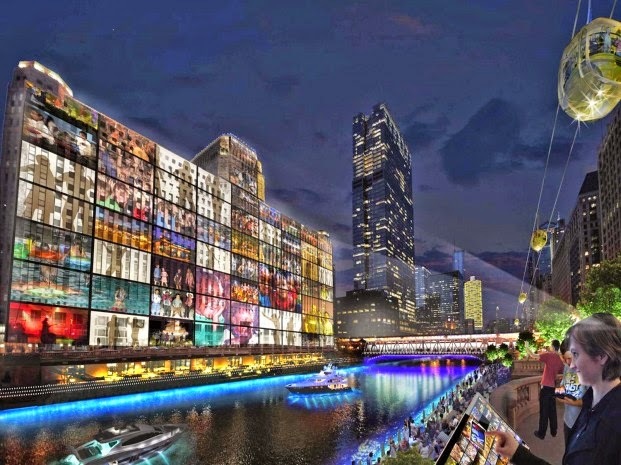 Chicago lighting design/plan competition. The City of Chicago takes the Playhouse Square initiative a couple steps further, by proposing ("A bright idea: City aims to light up architecture to boost tourism," Chicago Sun-Times) to enhance and use distinctive architectural lighting as an element of the city's identity..
as a step towards the creation of a lighting framework master plan. This holistic approach to illuminating cities has come to be known as a lighting master plan. While few cities outside Europe have a plan currently in place, the steps involved in creating one help officials evaluate how the layers of lighting – street-level, marquees and directional signage, and monuments or cultural landmarks – should work together and be energy efficient. The project began with analysis of all aspects of lighting in the city to define a set of goals for the next decade. With this research, van Stiphout identified six categories of light: urban lighting (streets, public areas), buildings and objects, art (indoor and outdoor), events and festivals, information, and advertising. In North America, San Diego (Downtown Lighting Master Plan) and the Quartier des spectacles in Montreal ("Axel Morgenthaler on the Quartier des spectacles," Spacing Magazine). While Calgary doesn't have a full-blown lighting master plan, they have created the Centre City Illumination Guidelines as an element of the city's urban design and revitalization program for their downtown. They are using an architectural lighting project for the Centre Street Bridge (below) as a way to illustrate these principles. Festivals. Lyon, France has had a lighting festival, Festival des Lumières, since the 1850s. According to the Christian Science Monitor article "Cities shed artful light on the canvas of night,"
building facades become moveable feasts of color and familiar landmarks take on an animated aspect. Street performances and music round out the celebration, and people are seen strolling and admiring the magically transformed cityscape. Night time lighting and safety. Earlier in the year I wrote a couple of pieces on this ("Night-time safety: rethinking lighting in the context of a walking community"), advocating for structured programs for addressing night time lighting issues in "the walking city." Association. There is an association, LUCI | Lighting Urban Community International, linking those cities addressing lighting as an identity element. 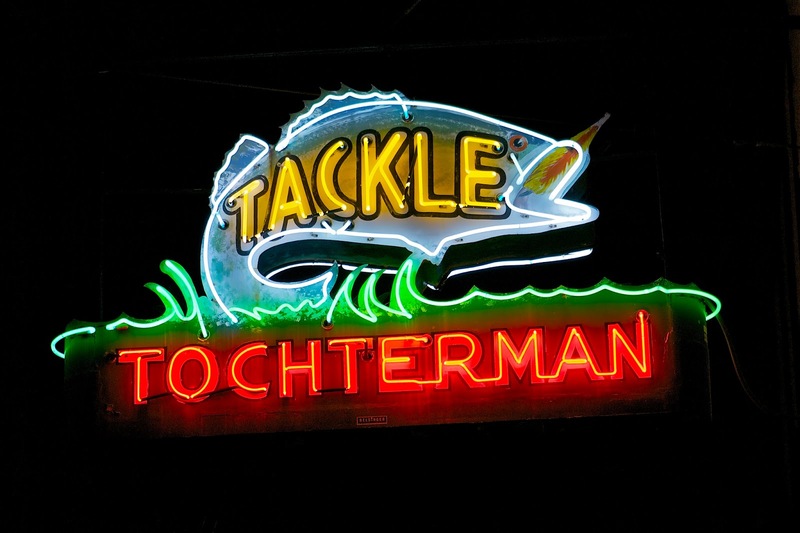 Electric sign, Tochterman Tackle Shop, Baltimore. Image from Pops and Mojo Photos. Signage. 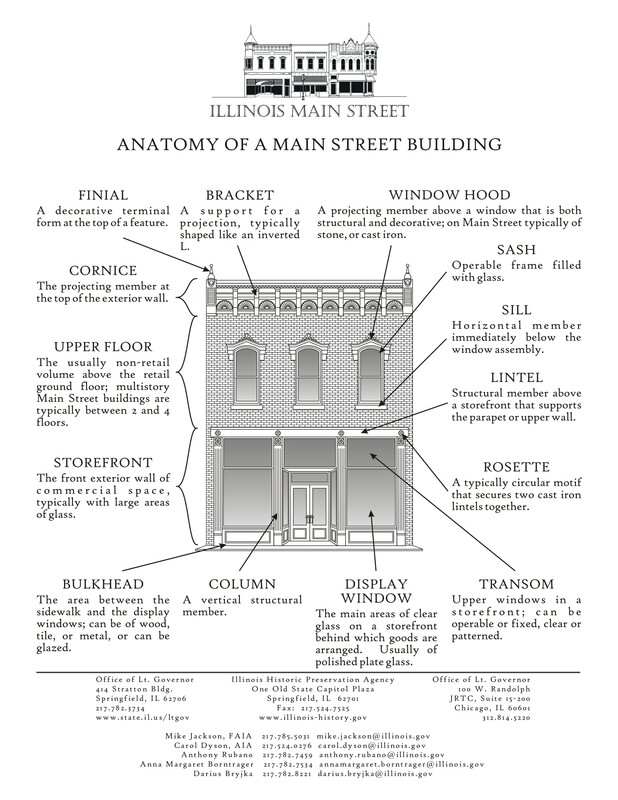 Many cities have programs to assist businesses with the development of high quality storefront signage, which can be a distinctive element of business, commercial district, and community identity. Typically, the focus isn't on electric or neon signs, which cost a lot more to construct and there are few craftspeople with the skills to do so. Still, last year I saw a presentation by people associated with the American Sign Museum in Cincinnati, and they were working with the city on a sign project involving artists, in a particular commercial district. 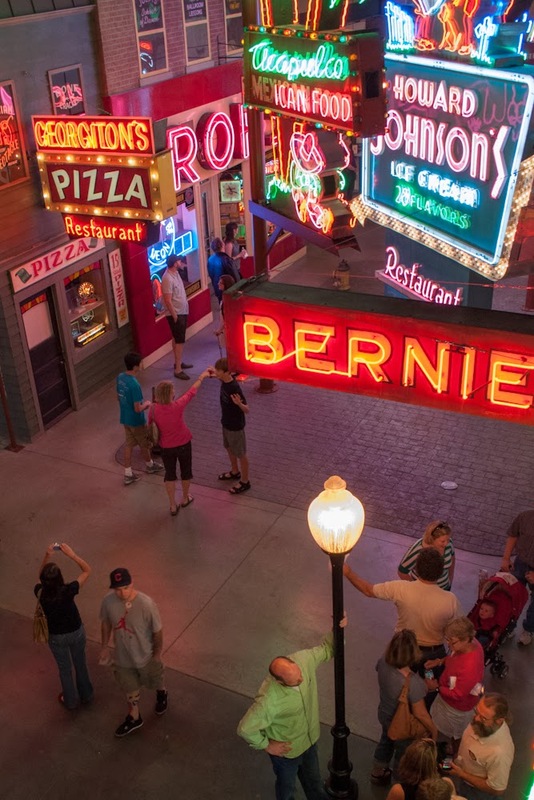 Image: Inside the American Sign Museum. City museums in Richmond and Pittsburgh also display electric and neon signs from defunct but memorable businesses that once operated in their respective cities. However, the program didn't promote the development of neon and electric signage specifically, and it occurred to me that they could extend the sign program city-wide, but focused on neon and electric signage exclusively, as a way to promote the museum and better tie it into other cultural and tourism promotion objectives. Night lighting as light pollution. Separately there are initiatives to reduce lighting at night, because of the impact on the environment ("Light pollution," National Geographic Magazine). Those issues have also been raised in the context of the Chicago initiative ("Environmental group takes dim view of Emanuel’s night light plan," CST). 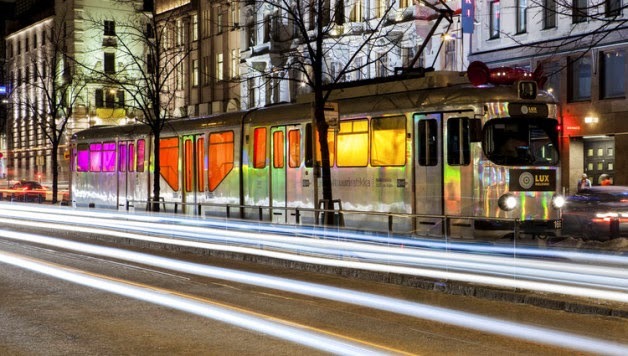 A Helsinki tram is specially lighted as part of the Lux Helsinki Festival. Wikipedia photo.